I think it's about time to announce that I was born at a very early age. I get credit all the time for things I never said. A likely story — and probably true. As quoted in The Groucho Letters (1967) by Arthur Sheekman. The sentiment predates Marx by 61 years, however; it likely originated with John Galsworthy in The Forsyte Saga. In Part I, Chapter II, "Old Jolyon Goes to the Opera", it's said of Old Jolyon that, "He naturally despised the Club that did take him." after another refused him because he was in a trade. I got $25 from Reader's Digest last week for something I never said. I get credit all the time for things I never said. You know that line in You Bet Your Life? The guy says he has seventeen kids and I say: "I smoke a cigar, but I take it out of my mouth occasionally"? I never said that. Interview with Roger Ebert in Esquire magazine (7 March 1972); more on this at Snopes.com: "I Love My Cigar"
I like pancakes, but I haven't got a closet full of them! Groucho's actual response during one of You Bet Your Life episodes referred to in the above quote. I did a bond tour during the Second World War... We were raising money, and we played Boston and Philadelphia and most of the big cities. And we got to Minneapolis. There wasn't any big theater to play there, so we did our show in a railroad station. Then I told the audience that I knew a girl in Minneapolis. She was also known in St.Paul, she used to come over to visit me. She was known as "The Tail Of Two Cities." I didn't sell any more bonds, but eh... they didn't allow me to appear anymore. Liner notes of An Evening With Groucho (1972) the recording of his appearance at Carnegie Hall. Lord Palmerston had similar last words in 1865: "Die, my dear doctor! That's the last thing I shall do!" Apparently said by Oscar Levant: "I knew Doris Day before she was a virgin" (as quoted in The Wit and Wisdom of Hollywood (1972) by Max Wilk). No known citation to Marx. First appears unattributed in mid-1960s logic/computing texts as an example of the difficulty of machine parsing of ambiguous statements. Google Books. The Yale Book of Quotations dates the attribution to Marx to a 9 July 1982 net.jokes post on Usenet. This may be original with Groucho, but the Quote Investigator mentions the earliest report found in a 1958 issue of Boy's Life magazine where it is attributed to Jim Brewer. Variant: Politics is the art of looking for trouble, finding it whether it exists or not, diagnosing it incorrectly and applying the wrong remedies. Apparently attributed to Marx in Bennett Cerf's Try and Stop Me, first published in 1944. A citation of this can been seen in the Kentucky New Era on November 9, 1964. Also attributed to Marx by Rand Paul in "The Long Stand," ch. 1 of Taking a Stand: Moving Beyond Partisan Politics to Unite America (New York, N. Y.: Center Street, 26 May 2015), p. 5. The original quotation belongs to Sir Ernest Benn (Henry Powell Spring, What is Truth?, Orange Press, 1944, p. 31); a first known citation reportedly appears in the Springfield (MA) Republican on July 27, 1930. 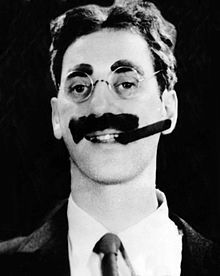 Some years back, after a childhood of preoccupation with comedy that led me to observing the styles of all the great comedians, I came to the conclusion that Groucho Marx was the best comedian this country ever produced. Now I am more convinced than ever that I was right. I can't think of a comedian who combined a totally original physical conception that was hilarious with a matchless verbal delivery. I believe there is a natural inborn greatness in Groucho that defies close analysis as it does with any genuine artist. He is simply unique in the same way that Picasso or Stravinsky are, and I believe his outrageous unsentimental disregard for order will be equally as funny a thousand years from now. In addition to all this, he makes me laugh. Groucho appeals on so many levels at once that you could go nuts trying to figure out whether it's the funny movement, the incomparable tone of voice, what he is saying, or that keenly witty face that hits you the hardest. I swear that if he never existed, we would sense a lack in the world of comedy, like that planet in the solar system that astronomers say Ought to be there. For me he is The Master. ↑ Gyles Brandreth, Word Play: A cornucopia of puns, anagrams and other contortions and curiosities of the English language, Coronet, 2015. This page was last edited on 11 January 2019, at 21:51.